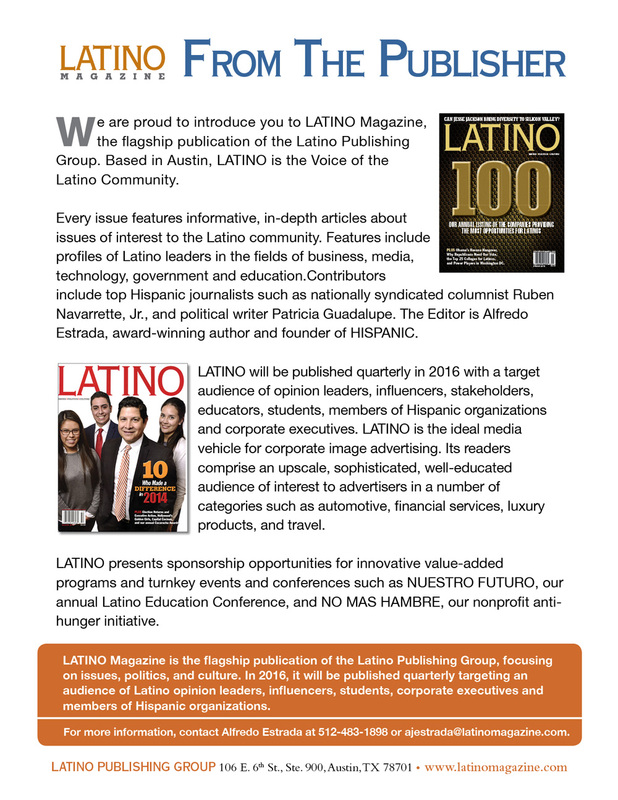 LATINO Magazine presented its second annual BRAVA Awards in Chicago at the University Club, overlooking Lake Michigan. “The BRAVA Awards celebrate Latina mentorship,” said Dalia Almanza Smith, LATINO. “We want to celebrate the achievements of Latinas in corporate America and the nonprofit world.” After welcoming guests at the luncheon, she introduced keynote speaker Jesus “Chuy” Garcia, Cook County Commissioner and Congressional candidate this November. The first company recognized was United Airlines, whose CEO Oscar Munoz is one of the few Latino CEOs in the Fortune 500. Chief Diversity Officer Gregory Jones presented the award to Elizabeth Lopez, Litigation Counsel in United’s Legal Department. Elizabeth received a BA from Stanford and a JD from Northwestern, and regularly takes on pro bono work through the National Immigrant Justice Center. Representing CIGNA was Toni Gipson, Diversity Manager. The recipient of the BRAVA award was Sol Flores, founding Executive Director of La Casa Norte (LCN), a community based organization whose mission is to serve youth and families confronting homelessness. Since opening its doors, LCN has helped more than 20,000 homeless and at-risk individuals. Peter Villegas, Vice President and Head of the Office of Latin Affairs for Coca-Cola, presented the final award to Patricia Mota, President and CEO of the Hispanic Alliance for Career Enhancement (HACE), a nonprofit which promotes Latinos’ career growth around the country. Many thanks to our partners United Airlines, CIGNA, and Coca-Cola; HACE, USHLI and the Barrio Foundation; Alberto Ortega, Gaby Rodriguez, Pat Pulido, and all who participated in our 2018 BRAVA Awards. ¡Gracias!